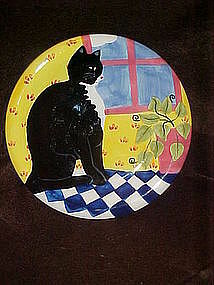 Hand painted black and white cat plate, Certified Int. I realize this is a salad plate from a set of dishes but it's so adorable it needs to be hung in a cheery kitchen. The black and white cat sits on a checkered tablecloth with a sunny cheery background. Made of hand painted glazed ceramic and measures 8" in diameter. Perfect condition. Very thick, and made by certified International Inc. I actually have 2 of these. Price is for each plate.